Where I left off in the side assembly post, the sides were just that, assembled. Assembled, however, leaves a considerable amount of work left to be done before the body can be fitted with the top and bottom. Here, I will show how I cleaned the side seams and constructed the internal skeleton with kerfing on the sides and braces across the back. 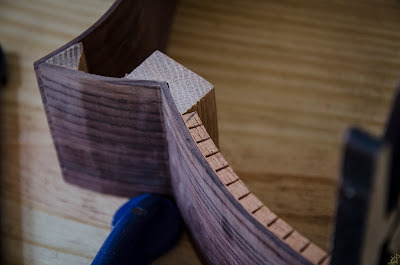 After seeing the volume of photos in these parts of the process, I decided to leave the top side and the actual shaping/affixing of the braces of the back for another post. First, I had to tend to the unsightly bits left over in the side assembly that were not trimmed prior to gluing. This was intentionally done to prevent any miscalculation in the length of the curves which, in spite of the rigorous steam bending episode, were short of where they needed to end up. 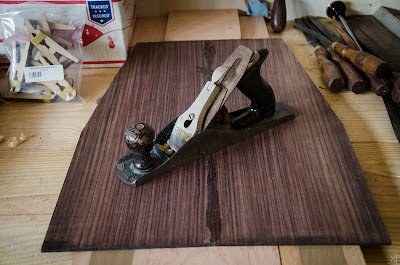 This corner was the only piece of the rosewood that had to go, and in one fell swoop it came free. Instead of cutting entirely through and potentially experiencing catastrophic tearout, I left it just barely connected and scored the fibres with a knife from the back side before breaking it clear. The slight bits remaining were easily sanded away. Next up is the heel block. 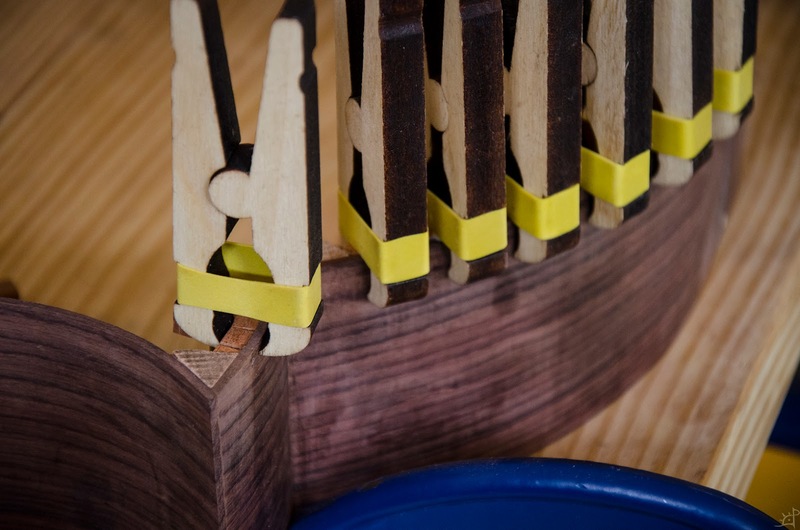 All those little corner and block supports were oversized because I would much rather have to sacrifice that disposable wood than the rosewood in the event of some overlooked misalignment in the clamping nightmare. 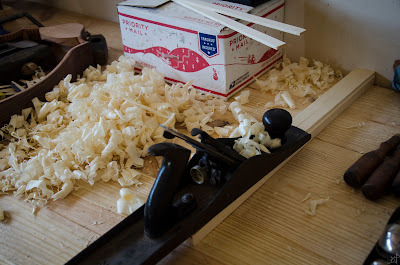 This one was easily taken care of with the block plane, its grain aligned nicely to receive the blade. The oak bits with vertical grain, not so much. 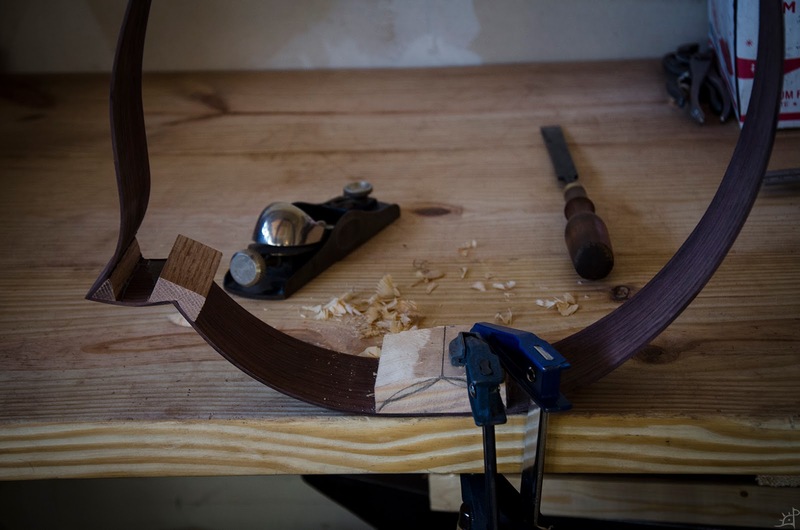 Those required a great deal of careful sawing, left slightly long, and smoothing in a later step. To roughly bring the sides into plane, I used a...wait for it...plane. 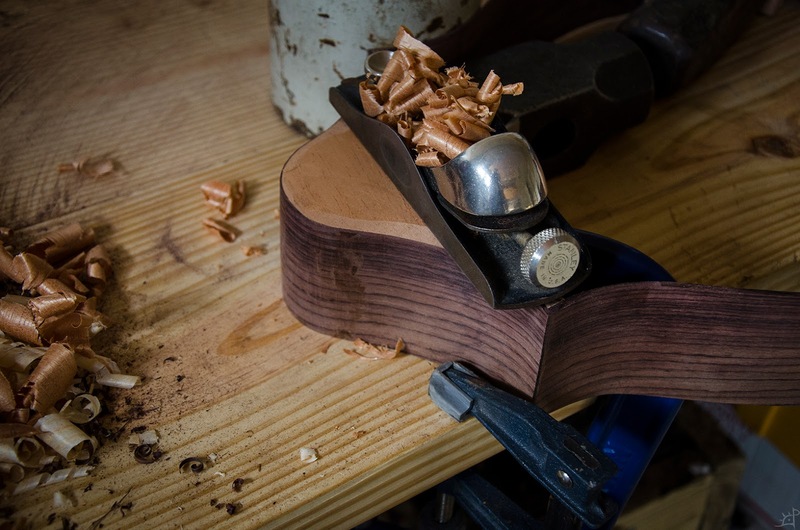 The jointer plane was just long enough to receive the entire length of the sides on its sole, leaving a nicely flat (if not planar) surface. 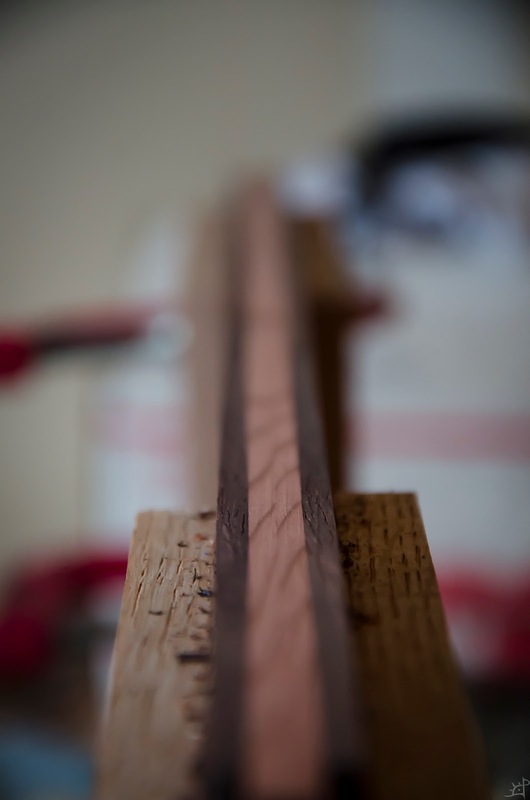 Finally, the Spanish cedar neck block needed the same treatment. This wood is such a pleasure to plane, and the shavings smell delightful. In a matter of minutes the entire shop smelt of a wonderful aroma that lasted well into the next day. Hooray! Because my bench was made rather quickly and is anything but flat across its width, I turned to the floor for my flattening surface. 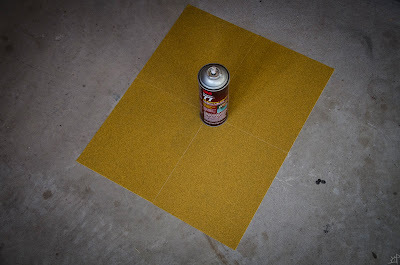 Carefully selecting the largest, flattest area I could find via the sole of my jointer plane as a check, I then used a spray adhesive to attach four sheets of sand paper to the concrete. This adhesive is the perfect combination of tacky and easy to remove. 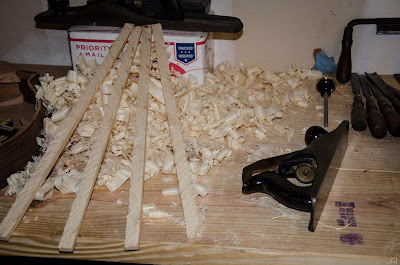 Once done, I can pull the sheets of paper off without leaving any mess behind for shoes or sawdust to stick to. 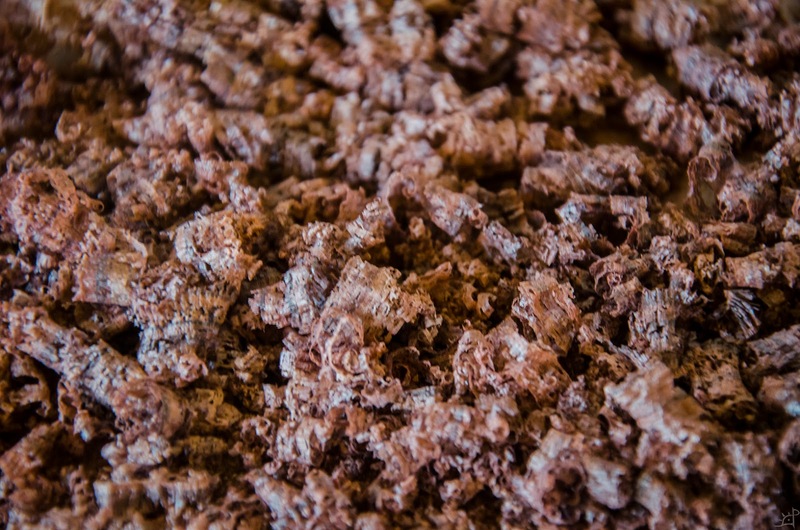 Careful application of pressure brought everything in all its misaligned grains to a near perfectly planar surface. Periodically, I checked the edge with the jointer plane sole, but this is not the final levelling, so I was not entirely worried about it. 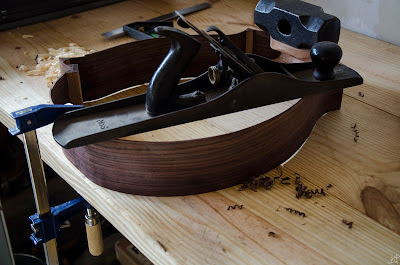 Something I ought to have done before attaching the sides was shape the heel block and inner corner (left side rectangular oak bit). Doing this across the grain in a soft wood was tedious, and neither the chisels nor plane wanted to cleanly cut at an angle I could manage while holding it to the bench. Eventually, persistence prevailed, and I managed a hemisphere that was only slightly off kilter. Now comes the exciting part that I have secretly been waiting for this entire time. 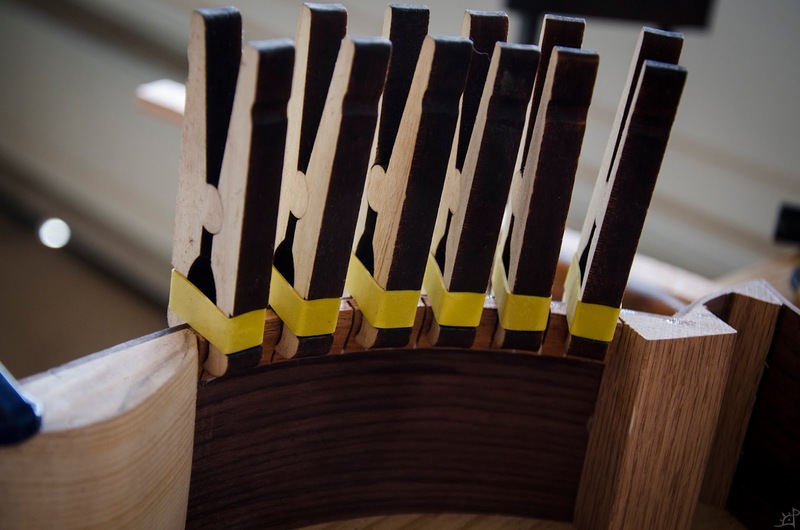 Seeing pictures of luthiers' work on the interior skeletons is what drew me to this (as well as actually wanting to learn how to play this when I am done...) and seems to be, from an artistic point of view, the most interesting. 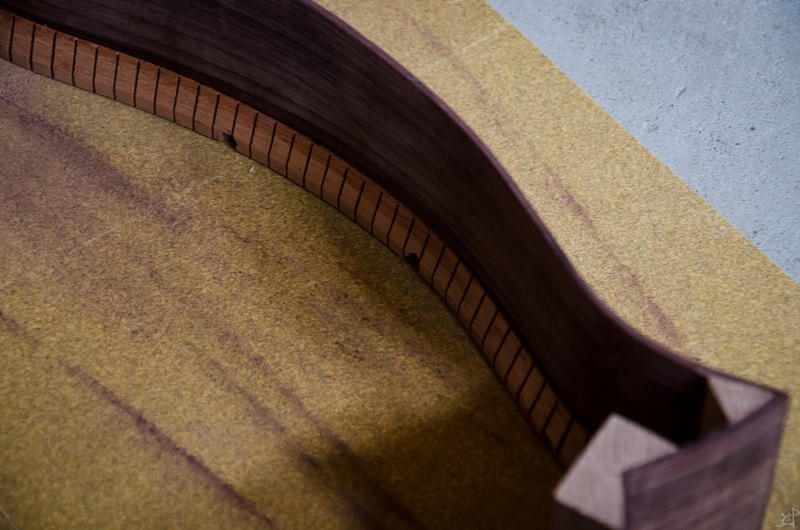 Along both the top and bottom edge of the sides needs to be affixed a thing called kerfing. 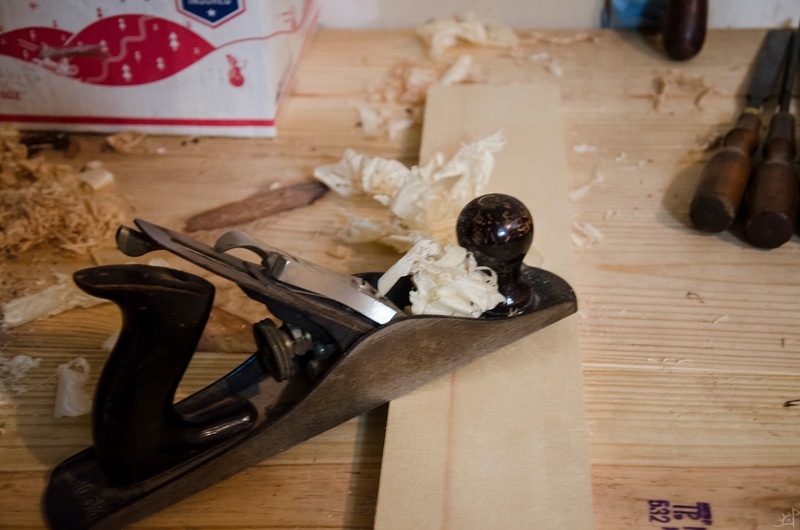 Coming from the word kerf, meaning the marks left behind in something after being cut by a knife or saw, these strips of wood have a series of periodic cuts that allow it to be very flexible while also providing ample surface to glue onto. 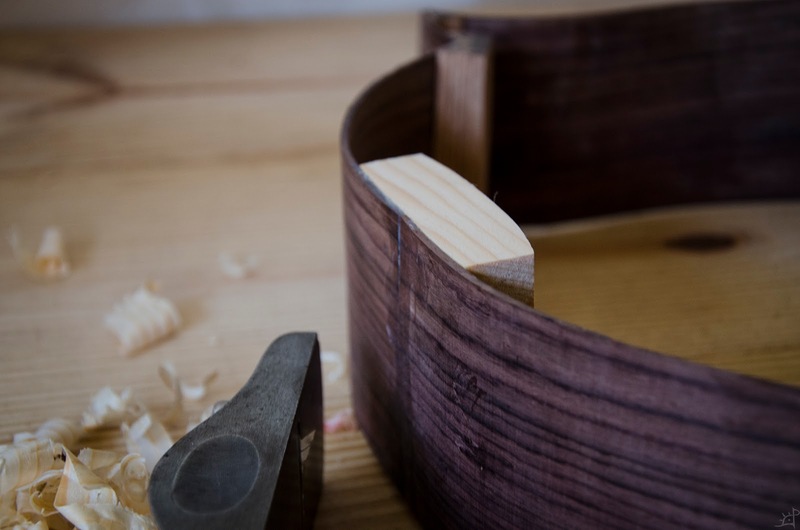 Due to the relative thinness of the sides, attaching the top would be either very difficult or very insecure without the kerfing. To ensure that the body is square and aligned, I used a piece of jointed wood as a reference. The heel is clamped down and the neck is pushed to the side to counteract the differential bending relaxation in the two differently shaped left and right sides. 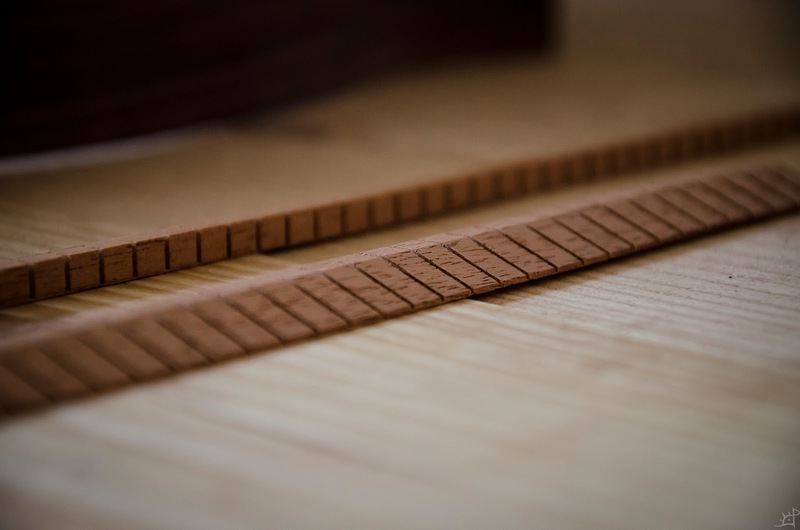 Although the kerfing will not do much to reinforce the skew bending, it will still affect it due to being a thin cold lamination, however insignificant. Whenever making things, I try to have them at every stage be as close to the final condition that it represents as possible. 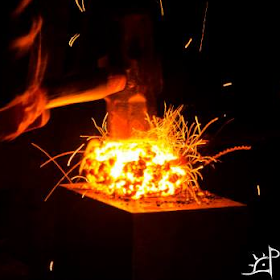 When forging blades, that means keeping the steel straight instead of leaving that correcting to the end. Although usually it makes no real difference to the technical qualities of the final products, it does change the mental attitude of detail oriented attention and the ability to see through specific processes to their ultimate relation to the outcome. 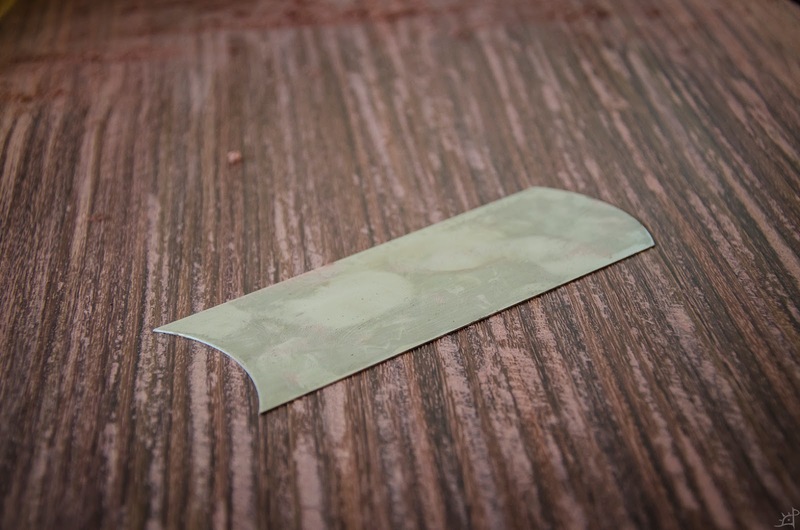 With the sides square, I marked the first bit of kerfing to be cut. Matching the angle of the terminus to the support blocks might not be strictly necessary, but it is a part of the visual flow. How the acoustics relate to the interior design is undeniably significant, but since I am neither learned nor experienced in this, I take the surprising relation between visual and mathematic dynamics and their projection into acoustics. Besides, if it does not look nice, I have no business doing it. 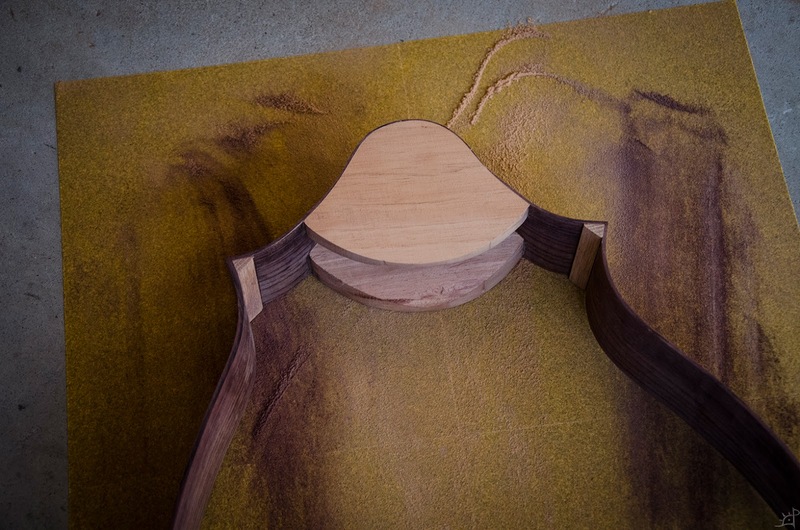 Aligned and trimmed to fit as tightly as possible, the kerfing is then glued in place with as many clamps as can fit. These funny little rubber band clamps allegedly distribute the right amount of pressure for this application, although comparatively they seem rather weak. When gluing the kerfing, I started at one end and levelled it to the top of the sides and clamp it before moving on. It is important that the top edge of the kerfing is flush with the top of the side, as that is the critical seam where the back will be joined. 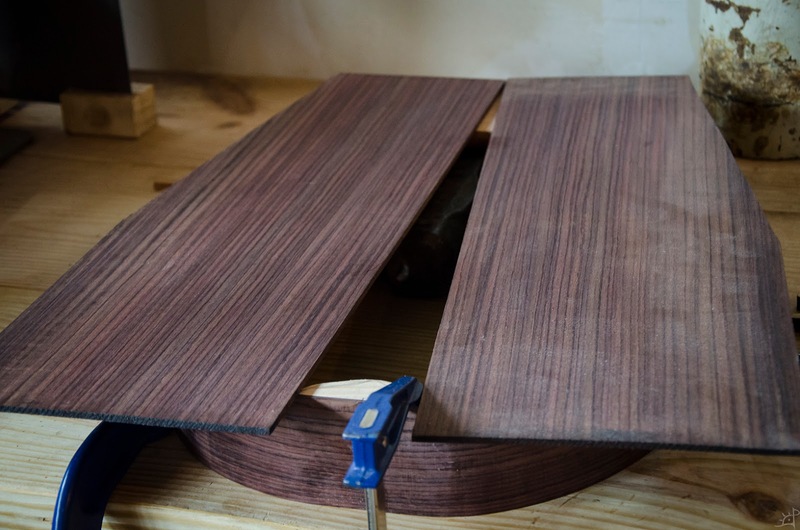 Many hours later when the glue has dried and I freed the clamps to bind more kerfing, which then dried and the cycle continued, it was finally time to inspect the back wood.Of a matching rosewood as the sides, these two pieces came with a strange chamfer on the top corners. What it is for, I cannot say, and I do not see where it could have been used to save wood on other cuts. 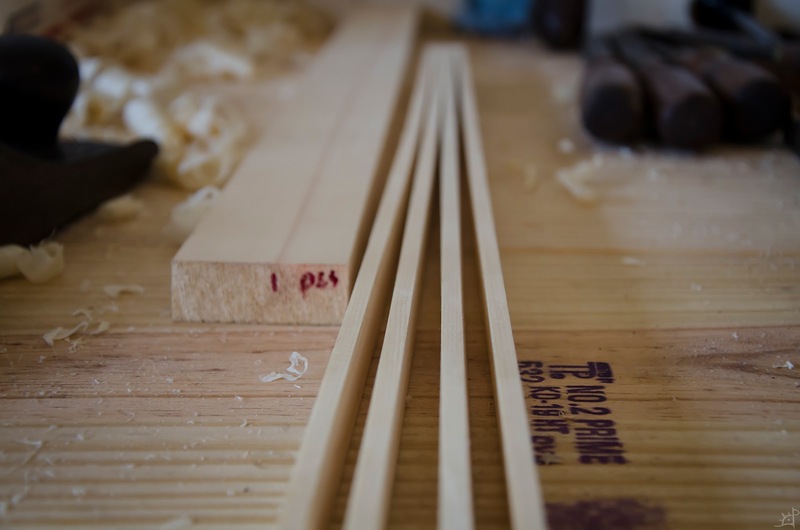 Either way, the inside edge is not perfectly flat, so it must be jointed before being glued. Stacked together, the two halves were just over 3/8" thick, which was too thin to reliably keep square to the face. So, I grabbed the wood for the top and added it to the stack. Planing all four pieces together also ensured that they all matched one another. 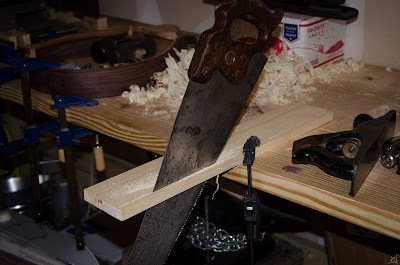 Without a proper means of clamping the lot, I had to clamp a vice to the bench, which was far from ideal but did the job. 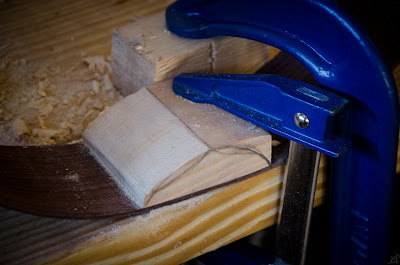 Whenever I need to joint long edges, I first flatten them as precisely as possible. 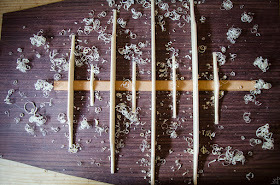 Then, to ensure they are square, I turn one side around and re-plane. This takes the high spots off of each board (which are matched) at the same time, meaning that both are simultaneously brought down evenly to the lowest point without making that low point worse. Imagine an X in an extreme case where before the two stacked boards were cut at a single straight angle / from one end to the other. Now, the two top corners of the X are removed so the V between them becomes more and more shallow, until finally the line is straight across. If that doesn't make any sense, don't worry about it. 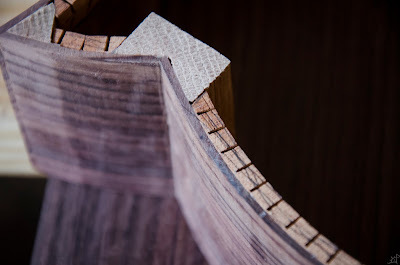 With the edges jointed, it was time to glue them. I have never used glue alone (temporary!) to hold something together. That reservation aside, I assumed that the same hard PVA glue that I have been using would do the trick. 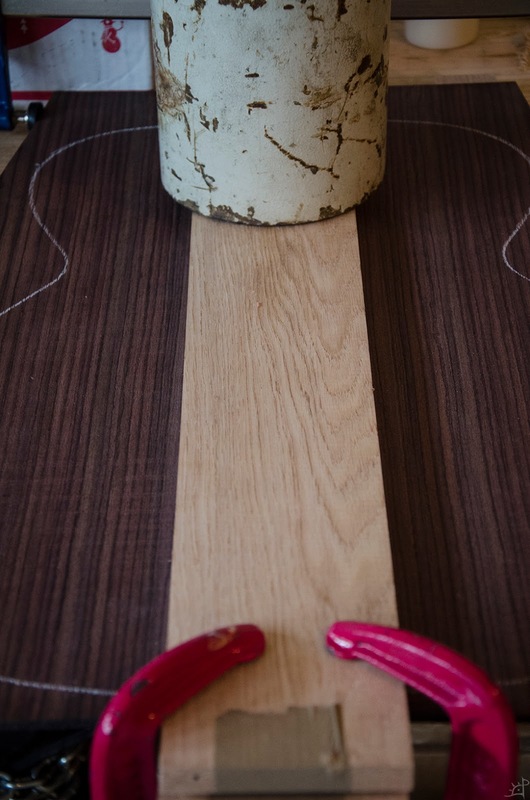 Planing two pieces of red oak as calls, then lining with packing tape, all is ready. 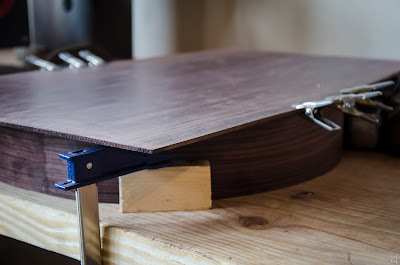 Because sideways pressure is the most important thing here other than buckling/misalignment at the seam itself, I had to use some clamps on the bench as holdfasts, then drive wedges between them to push in the edges of the sides to close the seam. Then, the red clamps at the bottom of the above picture were tightened aggressively, and a ~40lb weight placed on the other end where I could not reach with the clamps. You can just barely see a clamp on the far end of the sides where that strange taper I mentioned earlier was cut. With that wood conveniently removed for me, my largest clamp fit with about an eighth turn on the screw left to spare. With that mess drying for a spell, I turned my attention to the brace pieces. 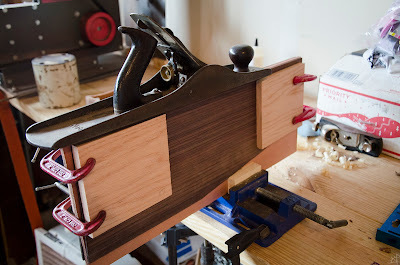 Clamped to death, that glue took quite some time to set, so I had plenty to figure out what I was doing. Instead of conveniently sized, narrow strips for the braces, the only thing I could find was this shaggy plank of 3/4"x3" Engelmann Spruce. Not knowing much about bracing, I thought this strange. Indeed, it needed to be ripped into what is essentially veneer. The 3/4" thickness would become the widest dimension of the braces, which meant I had to hand rip this thing into about ten pieces. First, however, I needed to plane the surface which looked as though it had been used as an angry cat's scratching post for the better part of a long winter. 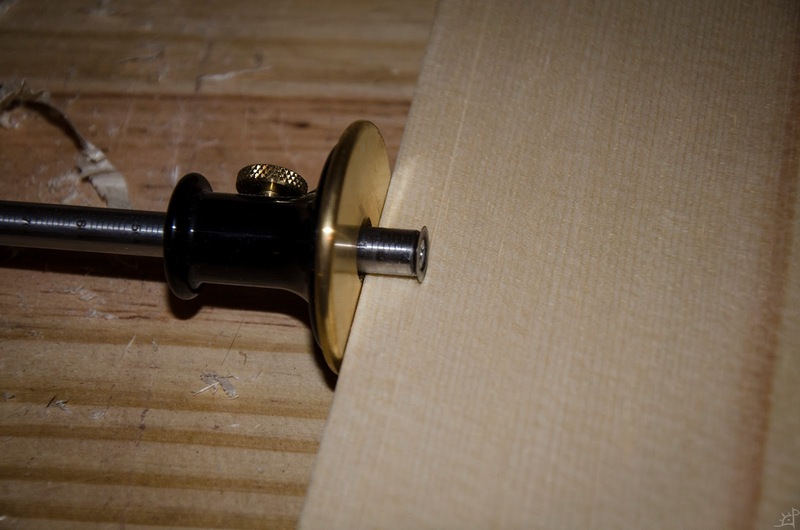 Nice and smooth, I marked an arbitrary 10mm from the edge and went to it. Later on, I decided it was easier to set up my post vice than keep doing whatever this is. Cutting anything this way is the wrong way, especially when I needed to be remotely accurate with it. Eventually, I had four pieces, which was all I needed for now. 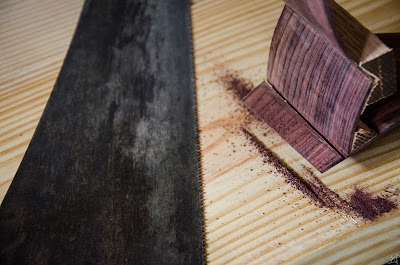 After each cut, I jointer planed the edge back to flat, so I would later only have to struggle through planing four sides of the thin wood instead of seven. Fortunately, the remaining spruce was wide enough to set underneath the resawn bits, leaving me a nice flat surface to joint on. If the bench was made properly, it would not have been much of an issue, but there is a severe ledge between the outer and middle boards (which themselves are not very flat). 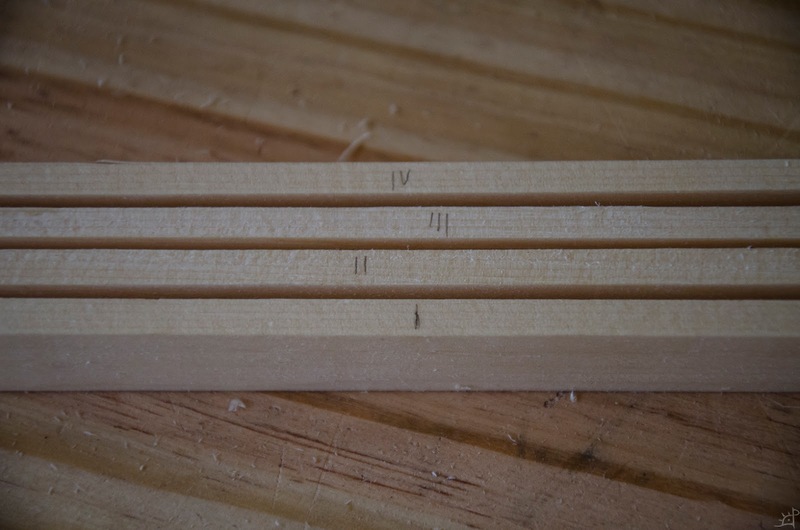 There we have it, four planed brace wood strips. Here I did the same jointing trick as with the backs. One end on them all was invariably thicker, so I alternated them with two thick ends on one side, two on the other, and planed all four together into a consistently thick bundle. Well, somewhat consistent. I ordered them thickest (I) to thinnest (IV) for placement in heel to neck. Because the body is widest on the heel end, I wanted the most support there. Does it matter? Probably not. But it is also a convenient justification for shoddy planing. 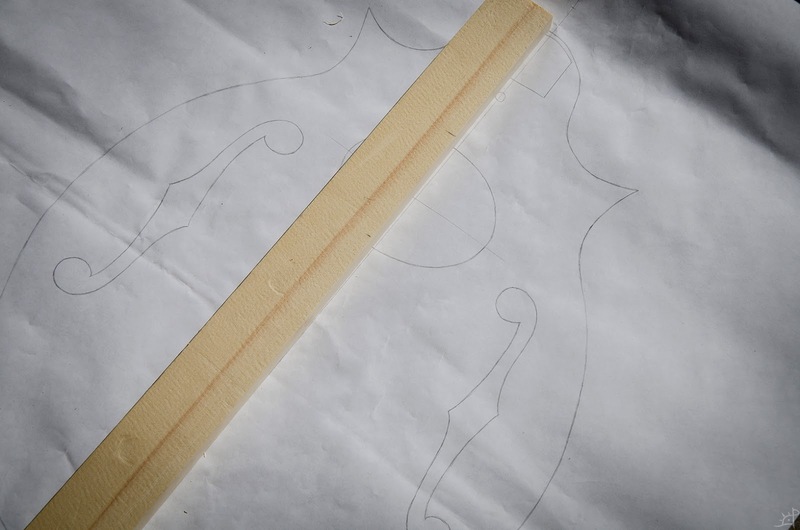 Before I got carried away in the excitement of actually doing something that looked like progress, I took a moment to mark my trusty stick with roughly where the sound hole will be. I did not want to have the back braces underneath where the hole opens, so with this I can measure where not to put them. A few of these pictures will be out of order and saved for later, as this all sort of happened at once. Glue dry and whatnot, I finally removed the calls and took a look. Overall, the seam was tight and flat, but in a few places needed minor adjustment. And, of course, the glue needed to be removed from the visible faces. After a stint with the plane, it was onto the card scraper. Freshly sharpened, I was thoroughly surprised by the shavings it made. Unlike the ones from a plane, however thin, these ones were like ribbons on the verge of collapsing into dust. There is a fascinatingly spongy quality to them that I could not help but share. Right then. With the kerfing attached, it was time to do the final sanding. This brought the sides perfectly in line with the top of the kerfing and prepared the edges for alignment with the rosewood back. 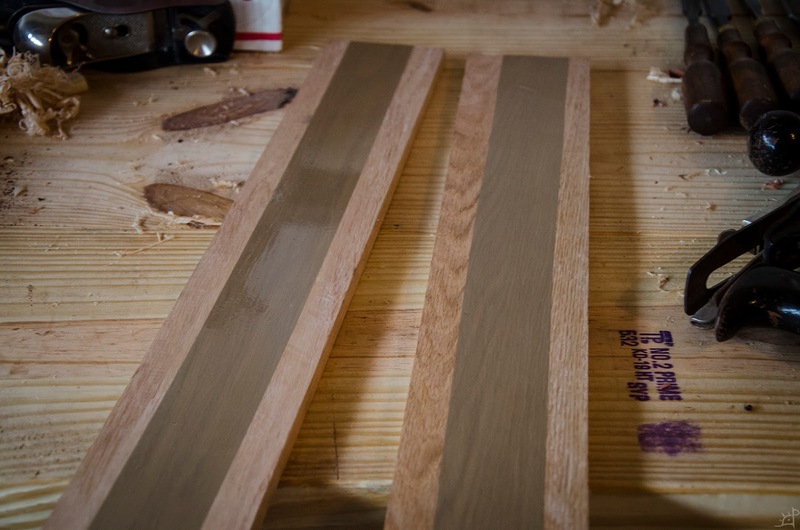 In order to satisfy that all edges had been uniformly sanded, I scribbled some lines on the kerfing and worked away at it until none of the marks remained. Smoothed and flattened, the edges lie perfectly with the back. I had to get creative with the clamping situation to hold the sides square without the top touching any of them (that blue one lies well below the back). 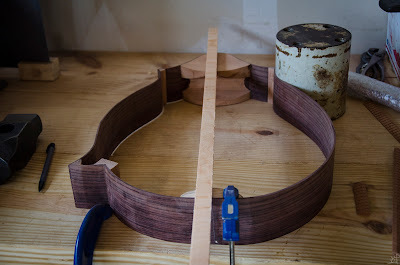 From here, it's onto the construction of the braces and union to the back.